I’ve been playing my guitar professionally for over thirty years. In that time, I’ve played or toured with a number of notable artists and bands, including: Al Green, Van Morrison, Foreigner, Peter Frampton, The Kinks, Creedence Clearwater Revival, Buddy Miles, Stevie Ray Vaughan, Mick Taylor of The Rolling Stones, Mick Fleetwood of Fleetwood Mac, Kansas, Black Oak Arkansas, Joe Bonamassa, Three Dog Night, Cheaptrick, The Cars, Joe Walsh, .38 Special, Bo Diddley, Steppenwolf, Steve Miller, Gregg Allman, John Mayall, and B.B. King. Needless to say, I’ve got some incredible stories; I’ve also gained a good bit of insight. I’d like to share a little of that here, especially since I hear about talented musicians struggling to “make it” in the new world of music we live in today. When I first started my music career, I spent all of my time developing my craft, developing my technique, and writing songs. I also played every gig imaginable—thanks to a club owner who “wanted to try something new” and my well-intentioned manager, this included a week-long surprise stint competing with exotic dancers for the audience’s attention. Like I said, every gig imaginable. There were definitely bumps in the road, and there were days when the struggle to convert my passion into a financially viable career seemed impossible to overcome. Despite the bumps, I persevered. Giving up wasn’t an option for me. Music was my passion, and I knew I’d never be happy with another career. All I wanted was to be able to pay my bills by doing what I loved: playing my guitar. In the dark days, hope and passion kept me afloat, and perseverance moved me along. Fortunately, my hard work and perseverance began to pay off. I was playing my guitar and paying my bills; as a bonus, I was having fun doing it! I loved the music, loved the people I played with, and loved performing. Looking back, life was good. At this point, I should have felt like a success, but I didn’t. In my mind, something was still lacking. At the time, the musicians I considered successful were those who had been signed to labels. They were releasing records and touring on a label’s dime, not their own. Talented musicians and bands were offered recording contracts. If you weren’t with a label, it was because you weren’t good enough. Needless to say, that’s how I defined success. That’s how every musician I knew defined success. That’s what I needed to feel like I had “made it”. After years of hard work, a day came where a label whispered in my ear the sweet nothings musicians dream of hearing: “We’ll put out your brilliant albums.” “You’ll be in stores everywhere.” “We’ll send you on tour!” The promises kept coming, and I was sold. I quickly signed their paperwork. I finally felt like I’d made it! For a while, things were great. The label footed the bill for just about everything up front. They handled all the scheduling, ordering, distribution, and marketing. I was playing great gigs, releasing new albums, and going on tours. Again, I loved the music, loved the people I played with, and loved performing. I felt like a success. But… life with a label wasn’t quite what I dreamed. Over the course of my career, I’ve been in various bands as well as on my own, and I’ve worked with a few different labels. To be fair, each of them had their strengths and their shortcomings. The fact that I had to deal with the shortcomings surprised me, even though I knew other musicians who were in the same boat. While with a label, I was so far removed from manufacturing, distribution, and marketing decisions that I barely knew what decisions were being made, let alone had any input on those decisions. I’ve had labels tell me what music I could release and when I could release it. I had to work the way they wanted me to work or not at all. And, to top it all off, I almost lost all of my rights to the music I had created. I’ve been with labels that had absolute control over my bookings, which sounds nice until they stop booking shows and don’t respond to phone calls. Scheduling shows or releasing music on my own would have caused a breach of contract and even more of a mess. If getting the label to respond about releases or bookings was hard, getting accurate sales records from them was even harder… which made verifying or fighting their claims that I owed them money nearly impossible. As worrisome as these issues were, I dismissed the nagging thoughts and kept playing. I told myself that, since I was signed with a label, I’d made it. I’d be okay. After all, I wasn’t the only one going through it; my fellow musicians were in the same boat. That’s just how it was; there wasn’t another way… Right? One day while on tour, I met a musician whose spectacular guitar playing blew me away. Thoroughly impressed by his talent, I asked him which label he was with. His response was not what I expected. He wasn’t with a label, and he did not want to be signed. It turned that he had rejected every label offer that came his way since starting his solo career. He wanted to be independent. His philosophy was simple: you don’t need a record label to have people to enjoy your music. This was different than anything I’d heard musicians say before. I’d always associated talented, successful musicians with labels. Yet, this guy, with all the talent in the world, was happy to be independent, and he was doing well. Really, really well. The guy had millions of fans across the world (currently millions on one social network alone). He spent his time writing the music he wanted, recording and releasing it when and where he wanted, and touring the world to play it for his fans. He was personally involved in all aspects of his career, from writing the music to selling his merchandise directly on his website. Yes, he had help, but he was involved and in charge. All of his involvement and work paid off. Without a label controlling what he did, he was free to take his career any direction he wanted, and he had the knowledge and network to make it happen. And, without a label to take its cut of his profits, he actually made a good living doing what he loved; there was no scraping by or making ends meet. In short, he’d really made it. And how was I doing after signing with my label? Not so well. So, shortly after meeting a musician who was thriving out on his own, I decided to walk away from my label. Walking away from my label has been a bit of a struggle. I’ve had to step up and do things myself that, for years, were done for me, often without me even considering what was going on. When I start to feel overwhelmed by all there is to do, I remind myself of my talented friend’s example—he had achieved success without a label, and so could I. Since leaving my label, I’ve started recording new music. This means finding the studio and producer, scheduling the time, making travel arrangements, and footing the bill myself. I’ve built up a nice network of contacts over the years, and I enjoy getting to choose exactly who will be involved on my projects. In terms of booking shows, I’ve been blessed with some incredible opportunities, and my show schedule is pretty full… but not so full that I have no time to write and record. That full schedule has led to some wonderful publicity and interviews, which is great as long as you do something with it; so, I’ve had to learn a bit about PR. I’ve also had to find and hire photographers, graphic designers, and videographers to create product packaging, promotional materials, and music videos. I’ve had to find manufacturers, order my merchandise, and figure out where to sell it. Very few retail stores still sell music on site, and even then they tend to promote only the biggest names and the hottest new acts. Many online retailers either won’t take you without a label or distributor (who happily takes a large cut), or expect to get a large cut of the proceeds themselves, or both. After years of only getting a tiny cut of the profits from my work, those options weren’t very appealing. So I focused on selling music in person at shows, and that’s gone very well so far. Speaking of “online”, the internet wasn’t even an option when I first started playing music. There weren’t websites, online retailers, social networks, or streaming services. It’s an entirely new way of thinking for this seasoned musician… but it’s something I’ve had to tackle. I had to create, manage, and update a website; fortunately, this also gave me the option of selling my music on my own website (in addition to live shows) and retaining all of the profits. No longer was I giving up large chunks of the income that my music produced. Another big plus for me is making a real connection with my fans; when they purchase my music online, I actually know who they are. When I have sold music in the past, I was often not told who purchased it; the retailer kept that information from me. It is very difficult to create a lasting relationship with a fan if you do not know who they are or how to contact them! I have also created various social media profiles to connect with my fans, and I regularly update them with new content (often linking back to my site for the full post or video). And I’m working to convert those fans from likes and followers on social networks to full fledged relationships with complete contact information on my own site. I can think of many artists that struggle to communicate effectively with fans on social media sites; their posts are just another blurb scrolling past the fan’s homepage, often going unnoticed. Since these fans represent my best opportunity to sell new releases and attend my shows, I am very interested in connecting with them. I’ve definitely had some help along the way—friends and family, kind fans that want me to succeed, and hired pros who can do what I can’t—but I haven’t sat back and let others do for me, without me. 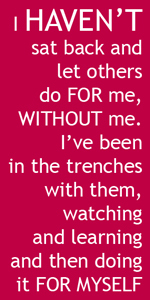 I’ve been in the trenches right along with them, watching and learning and then doing it for myself as much as possible. It’s been overwhelming at times, but I persevered, just like I did when I first started playing. The good news? It’s starting to pay off. I’m writing and recording the music I want, playing with phenomenal musicians, and performing to wonderful crowds of fans. I’m connecting with those fans online and at shows. I’m selling my merchandise. I’m able to pay my bills by doing what I love: playing my guitar. I’m starting to feel like a success. I know how I defined success years ago. Having traveled that path and now traveling the one I’m on, I humbly admit that I was wrong. I wish I knew then what I know now, but I can’t change my past. I can, however, help others avoid the mistakes I made. Every day I hear talented musicians pining for a record deal—from up-and-coming young artists to old pros who have been burned by labels before. I see their hunger for that definition of success; I hear it in conversations with them, in their posts online, even on those reality TV shows. 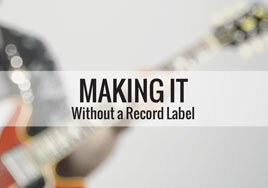 Yes, record labels can do a lot, and you might be able to sign better contracts than I did. You might be savvier than I was. But, you might not need a record label, and you might be better off without one. Today is the best time in the history for making music as an independent artist. There are so many tools available that simply didn’t exist before. Moreover, it’s truly fun to be an independent musician, evolving without any strings to tie you down and hold you back. Yes, there’s a lot of work involved. But for me, the hard work is so much more enjoyable knowing who and what I am working for! Compelling!! And reassurance that labels aren’t the more appealing option it all depends on the artist and situation appreciate the insight V’s Up Haters Down! Thanks for posting, Dante. Every artist has to decide for themselves what the best path is for their career. I hope my insight will help artists be informed. Haters Down…I second that! I love the article. Made me smile to hear someone talk like that. The old days of big labels and getting signed seem to be for manufactured bands and singers today. Many talented musicians give up way to early because they do not get that bazillion dollar contract and all the fame. Thanks for some great advice. Thanks for the kind words, Jim. Today is a new day for artists. Thank goodness, right? lol Thanks for posting! I’m in the same boat a Gospel Artist trying to make it happen.The battle on getting radio play to distribution i hear what you said man your advise is priceless.Thanks for making Me FEEL SOMEKIND OF WAY. Glad to hear that my message came through loud and clear, James. Thanks for posting and stay the course, my friend! I had the pleasure of meeting Rocky and hearing him perform in Vancouver with John Mayall a few years ago. I enjoyed this article. Inspiring and encouraging. Thanks. Thanks for the kind words, Jeff. Glad to know that my experience can help others. Hope to see you next time in Canada! That is a great post and I agree with it 100%. A lot of artists should pay close attention and save themselves a lot of time and stress worrying about getting signed to a major record label. I have my own little independent label where I do my own promotion, and produce my own music, and I don’t have to answer to nobody else, So Ian am free to enjoy what I am doing. Thanks for the kind words, Joseph. Sounds like you got this figured out. Congratulations, my friend! Stay the course. Thanks for the compliment, Illa. I enjoyed sharing my experience and I am happy to see that my message is being heard! You and your daughter are one of the many reasons I wrote this article. I am so happy that my experience is helpful. Thanks for posting, Christine! Rocky! Yes! Exactly! This is my answer to artists who ask that question – how do I get a record contract – my answer – You don’t want a record contract! The challenge is that to be successful in today’s DIY music business, you have to learn business. Including booking, marketing, fanbase development, artist development (meaning yours), etc. And many artists make the mistake of thinking they don’t need to learn anything, except their craft. If you think of yourself as a business owner, and run your music like a business, this is the best of all times to be an indie musician! Sounds like I was preaching to the choir, Debra. Keep spreading the word that today is a NEW day for artists! Thanks for posting! Excellent piece and very informative Rocky. I was acutely aware of artist/label horror stories from my time presenting music on the radio, but until now, I admit I also believed that the record companies somehow defined the nature of musical success. It is a scary proposition to do what you have done, but you have my greatest respect for your worthy undertaking. Best wishes always. We are a 2 artist family and we are working this very angle. It seems to me that labels want you to come to them with the complete package anyway. If I’m going to record, develop the fan base and merchandising, I’m going to try it on my own first. The big hold the labels had was that it took money to distribute. With the internet, it’s much easier and cheaper to get a good product out there. Rocky…Compelling piece! I have been a fan since the old Lightning days at Sneaky Pete’s! I have forwarded this to my son, who himself is on the path…guitar is his passion, he plays with anyone and everyone, from Deep Ellum, Austin, Nashville, and LA. He somehow scratches out a living…he’s so happy because, like you, music is a passion. He told me he felt at home on stage. I consider him a success story. Thanks for telling yours! Very well written, open and honest, Rocky. Best wishes for the next part of your career after The Bluesbreakers. Great story Rocky! Sometimes less is more, in more ways than one. More work, but more peace, beats no control, and no choices. You definitely will never have a problem earning a living with your music, songwriting, and especially your guitar playing! You’ve paid your dues and your head is on straight, so continue to reach for the stars and show the world what an ol’ boy from Oak Cliff boy can do on a six string guitar! Rocky, the problem is contacts. Getting a band started, even, is a labor of Hercules.without agents and labels, it’s hard to meet the right people. A good article. Had to read again as I plan some new ideas. Thanks for sharing. I am still part time musician. Reason why I like your story is that I thought I was going to play full time. Apparently family and public duty takes my some of my music time away. When technology has advanced and music distribution changed there was independence for musicians today. I did work with the help of some people in my town. The ones who like my music. I love playing the blues. Some folks like it here. But this place like some other weird music. I think other people from the world like my recordings. But I don’t have budget to travel and tour. I think music is like this now a days. Through cyber mostly. I really can’t wait to perform live for these people.